Beacon Falls, CT – June 19, 2013 – Labor-saving automated picking machines have been a boon to high-volume commercial laundries since they were first introduced. High-production spreader-feeders have raised the bar on throughput, however, causing some operators to look beyond current picker options. 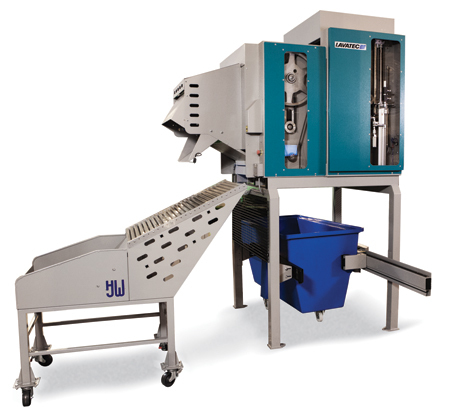 Tomorrow, Lavatec Laundry Technology, Inc. (LLT) is introducing Double-UP™ - the new LavaPik UP-22 picker with double jaw grip – and will have on display in booth 3221 at Clean 2013, the three-day show being held June 20-22 at the Morial Convention Center in New Orleans. Double-UP allows for 20% more picking productivity with its identical-twin jaws coming up full on nearly every stroke without missing a beat. Recent comparative tests prove its capability. A single jaw machine and Double-UP twin-jaw technology took on two cakes of identical weight sheets. The Double-UP picker finished in 10 minutes and 20 seconds, nearly two full minutes sooner than the single jaw at 12 minutes and 18 seconds. The Double-UP moved every piece of linen with just 113 strokes, nearly 25% fewer than the single jaw’s 150 strokes. For more details on the LavaPik UP-22, as well as Lavatec’s full line of tunnel washers, extractors, dryers, ironers, folders and other products, visit the booth or the web site at www.LLTusa.com. Double-UP™, the new twin-grip LavaPik UP-22 picker from Lavatec Laundry Technology (LLT), delivers 20% more productivity than current single-jaw picking machines.